The name of Triumph was one of the most famous in motorcycling. Its demise in 1973 caused anguish in the worldwide biking community. 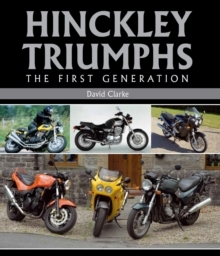 Hinckley Triumphs - The First Generation examines the re-invention and rise of Triumph Motorcycles. The first generation of the new bikes was manufactured from 1991 - 2004. Sharing the same spine frame and standard components, the innovative new models from the new company paved the way for Triumph's continuing success.